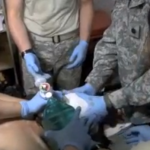 At the table with the patient with the leg wound, Staff Sgt. Ben Swob, part of the newly arrived group notices the injury site is beginning to bleed again—heavily. He decides, unilaterally, to apply a second tourniquet just above the first. The Afghan man, sedated with morphine lifts his head and cries out in pain as the additional tourniquet is twisted tightly in place, above the first. A few minutes later, whenBattalion Surgeon, Cpt. Matthew Rodgers discovers what Swob has done he steps into is face and demands to know why. Shortly after, Rodgers pulls Swob aside and chides him for making the decision without consulting the doctors. Swob, though surrounding by other people, momentarily appears alone and suspended in time by the gravity of his mistake. 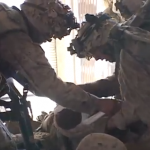 When there’s a delay with the Medevac choppers that will transport the patients to a hospital near Kandahar Airfield, Rodgers asks Swob to un-bandage the wound, remove the second tourniquet and show him the bleed. As Swob slowly undwinds the tourniquet, there is a small but distinct flow of blood that squirts from the wound, with each pulse of the man’s heartbeat. “Should I put the tourniquet back on,” Swob asks? Rodgers knods. Without looking up, Swob, packs the wound with rolls of Kerlix, an absorbent gauze bandage—and a small, nearly imperceptible look of relief appears on his face as he re-applies the tourniquet.